and it’s all because of you! * We had our biggest KARMA WEEK ever! * We are sharing our mats with new as well as returning students and some who have found their way back! * Our CYA Teacher Training School is growing momentum! Silver Linings – before, during & after cancer is growing! & other outreach community projects are growing! * Our new student lead “Community Support” program, has been able to help a special needs student come to classes! * Our workshops are starting up! humbled and grateful for all of your support! Hmmm Says the Voice of Reason? Looking for “the meaning” of the events that take place and assigning “the meaning” to the quality of our lives may bring disappointment. What if we just assigned love, patience and trust? I trust in the universe/God (God, Jesus, Allah, Krishna your choice). When I do this, it allows me to feel at peace and fill myself with a sense of self-confidence and well-being in what I am experiencing at the moment. I have noticed that when I assign the “quality of my life” to the experiences be it pleasant or distressing it has a way of changing the colour of how I feel about myself, others and about the world at large. This brings a sense of distrust to me, I have the ability to imagine anything and being human I sometimes get caught up in my imagination, rather than putting peace and love first. Imagine, that your friend does not show up for your dinner date. Here’s where your ability to choose comes in, and how or what you will make this experience mean to you. You can choose to allow being “stood-up” to reinforce your feelings of unworthiness bringing all your insecurities come into play, or you could assume that something big has happened and go into panic mode trying to find the friend and assume the worst, or you could open yourself up to that maybe it was just a way of the universe to open up some you time. Let’s say you come into a class and your car is the only one in the parking lot. (Rarely but it has happened) Here is where you have a choice, you could go home cause nobody is there, or you could come in and treat yourself. DON’T GO HOME! Just to let you know, I have already made the decision to teach, so you are welcome and are not a “bother”. The second this is that I will then ask you if you want yoga or would you like a Thai Yoga Massage session. My thoughts are that if the universe has delivered only you to our door, it may be because you are in need of some extras, could be the yoga, the massage or maybe just the friendly exchange. Whatever it is, you are already here and so am I so don’t go away come in, the universe opened up the time for you and I to connect. Here is another scenario and trust me both Darren and I are not strangers to this one… Let’s say, you were recently laid off and are having difficulty finding a new job, consider that you might have hidden gifts or passions that were untapped in your regular career that you are now available to explore. The universe might simply be moving you in a more fulfilling direction. Don’t give up… just try to look at the situation in a different light. For me, maybe I wasn’t supposed to be a graphic designer in a corporate world for all of my life… but yet I do use my skills in so many things that I now do for our community and for Ohana. The world just made room, and I eventually allowed. Let’s say you have recently lost a loved one, gained weight, lost money, or gotten in a fight with your partner, see if you can infuse the experience with a meaning that feels and brings on love and empowerment. What choice can you make that will open a door for you and allow you to embrace the experience just as it is or just as you are. By allowing clarity and love into your life the world will become more positive, clearer and it will allow you to feel abundance in a whole new way. It takes practice, perseverance and time… but things do change and the outcomes are so much more positive for you. When we begin to bring consciousness to what we are “making things mean”, we may be shocked at the messages we have been feeding ourselves all these years. Scripted by the views of ourselves or by others. If we take the reins, and assign a kinder perspective to the meanings of our experiences, we will likely find ourselves on a much more pleasant ride. 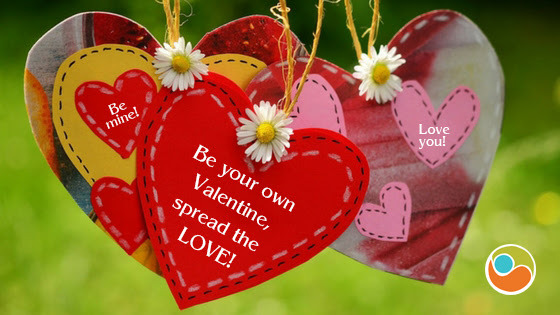 With this I send you love, light and happiness… be your own biggest valentine! Our classes are specifically designed for EVERYbody, from seniors to junior, beginners to advanced. Our studio's has been designed specifically for our classes offering a safe, clean and friendly environment. on your path towards, better health, and life balance. don't let it. Come and see Nicky, as there is always a way to work things out! where all who join us under our roof are treated equally and NObody gets left behind.